It seems that things are moving fast for the 39-year-old actor and his girlfriend. Since dating Mainland Chinese model Carina Zhang (張馨月) last year, Raymond Lam (林峰) has deliberately kept a low profile and chose not to comment directly to the press about his relationship. Previously seen bringing Carina back to his hometown in Xiamen to pray to his ancestors, Raymond went to Yancheng, China to visit Carina’s family relations for Lunar New Year. Spending so much time with each other’s families while observing traditions indicate that Raymond and Carina are in a truly serious relationship. Some speculate that the couple is inching closer to marriage. 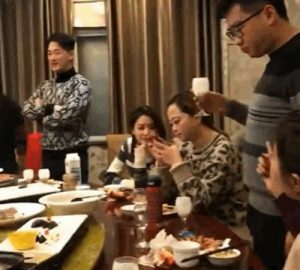 On February 8, Raymond was photographed enjoying dinner with Carina’s family. In the photo, Raymond was standing up with arms crossed while Carina, sitting, is seen chatting with her family. A woman believed to be Carina’s mom is happily toasting to guests with her glass, seemingly delighted with her future son-in-law. 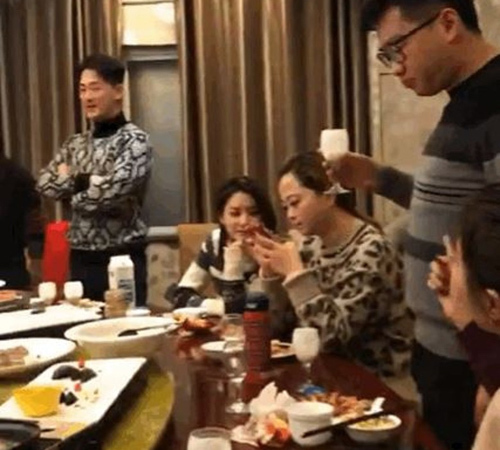 In another shot taken, many male members of the family are standing up with their glasses raised, most likely returning Raymond’s toast to them. When their relationship was first discovered by the paparazzi, there were also reports that Raymond’s father had in fact seen Carina before, and the two had been part of a family trip. Previously, Carina was also spotted at Raymond’s friend Michael Miu’s (苗僑偉) wedding anniversary celebration. Though the couple intentionally maintained distance in photos, Carina has already become part of his friends’ circle, whereas Raymond too had also appeared at Carina’s brother’s wedding last year. Just last month, Raymond brought 27 year-old Carina to his home to pay respects to his ancestors. It was significant for her to be present at the event, as she was included in such an important family tradition. With his five-year relationship with actress Karena Ng (吳千語) ending in heartbreak last year, will Raymond find lasting happiness with Carina this time?